Turns out that Apple didn't forget about the Mac Mini after all. Change has finally arrived for Apple’s long-neglected Mac Mini. 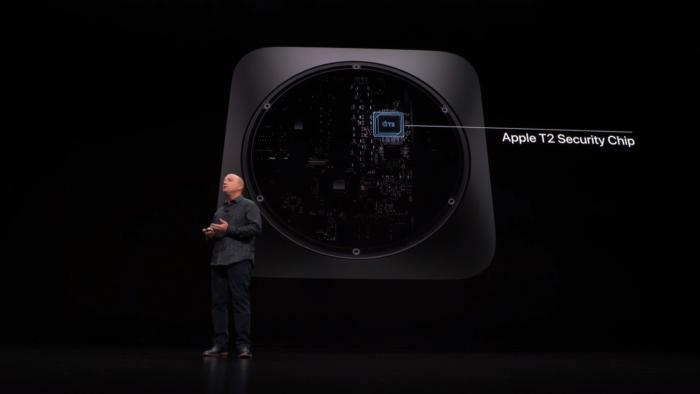 At its Tuesday event in New York City, Apple announced an update to its compact PC that includes new four- and six-core Coffee Lake processors, faster RAM, and larger storage drives. 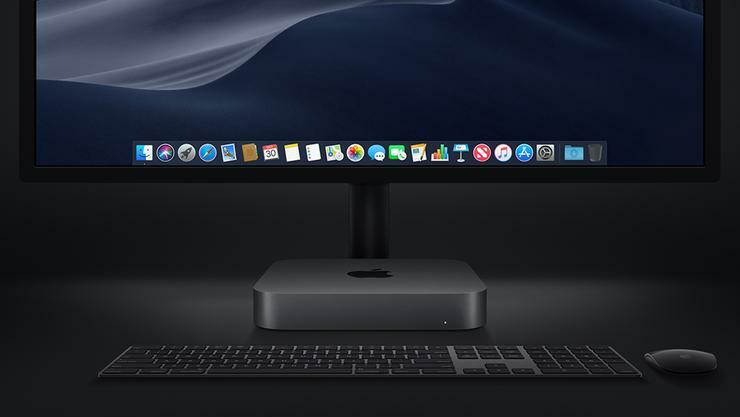 When the revamped Mac Mini hits shelves next week on November 7, it’ll be the first real competition that mini PC makers will have seen from Apple in four years. It’ll also be a different kind of rival, too: With a starting price of $799, it’s no longer the $499 entry-level Mac it once was. To get a sense of just where this new Mac falls, we pulled up the specs on one of the more prominent mini PCs we’ve seen this year—Intel’s Hades Canyon NUC. Let’s see how Intel’s top contender does against Apple’s latest. Obviously, without a Mac Mini in hand, we can’t compare actual performance. But based on the specs, we can make some general calls based on what you get out of the box. 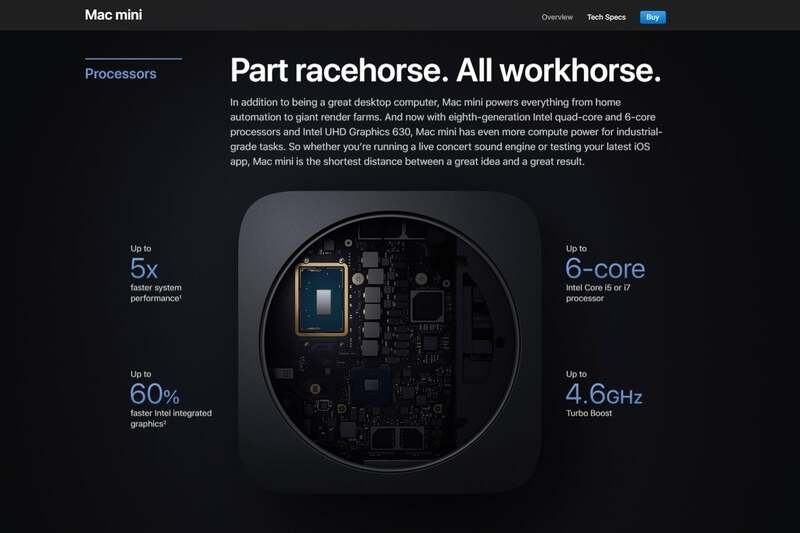 The Core i5 Mac Mini's processor specs are a dead lock for the Core i5-8500, but we can't be sure, as this image on Apple's website implies that the Mini's CPU is embedded...and the 8500 is a socketed part. With higher base clock speeds, the Mac Mini should outperform the Intel Hades Canyon NUC and its mobile-class CPU on tasks that utilize only one core. The Core i7-8705G and Core i7-8809G are solid performers with four cores and eight threads, but they’ll have trouble beating raw speed. A face-off between a six-core Mac Mini and the Hades Canyon NUC in multi-threaded tasks will also likely favor the Mac Mini. A quad-core Mac Mini and the Hades Canyon is less easy to call, especially since Apple could end up favoring cooler temps and throttle performance during extended workloads. When it comes to on-board graphics performance, the Hades Canyon NUC will whomp hard on the Mac Mini. The Mac Mini lacks a discrete GPU, even as an optional upgrade. Instead, Apple mentions connecting Blackmagic’s eGPU via a Thunderbolt 3 connection as the way to upgrade from Intel’s UHD 630 integrated graphics. In contrast, the Kaby Lake G processors in both models of the Hades Canyon NUC feature Radeon RX Vega M GPUs. When we reviewed the higher-end version of the Hades Canyon NUC back in March, we could play modern AAA games like PUBG on the RX Vega M GH. The Hades Canyon NUC also supports external graphics over Thunderbolt 3, so it has a clear advantage on this front. User upgrades for both the Mac Mini and Intel Hades Canyon NUC are limited, but more so for the Mac Mini. As far as we can tell, only RAM can be upgraded on the Mac Mini with relatively little stress, up to a max of 64GB. That’s in theory, anyway—we have to wait for a teardown of Mac Mini to confirm how the SO-DIMM slots are configured. Be prepared to pay big bucks no matter how much extra RAM you want, though. Apple systems usually require particular specifications for compatibility. Getting access to the RAM and storage slots in the Hades Canyon NUC is a cinch. Just unscrew and remove the bottom plate. 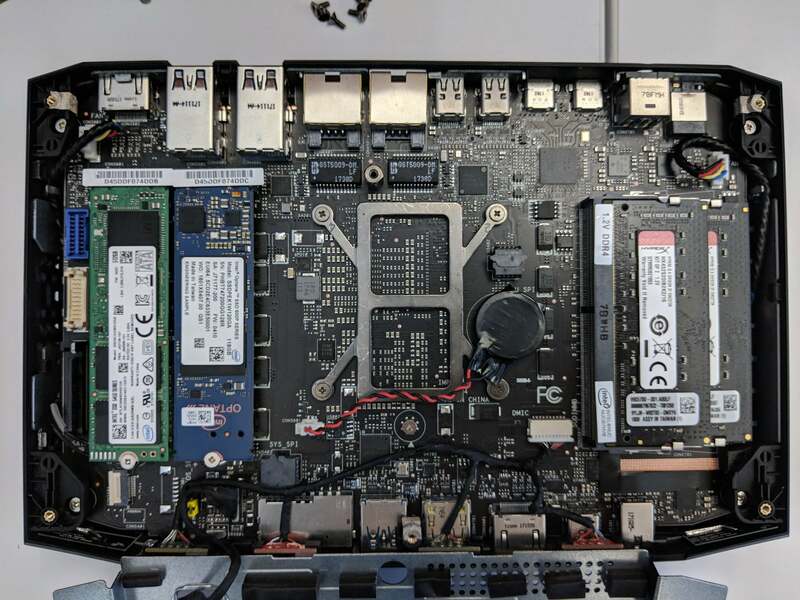 In Intel’s Hades Canyon NUC, you’re restricted to just storage and RAM upgrades, but they’re very easy to do and don’t have rigid requirements on specs. You get two M.2 x4 PCI-e Gen 3 slots for SSDs, and two SO-DIMM slots for RAM. The system can only support up to 32GB of RAM total. 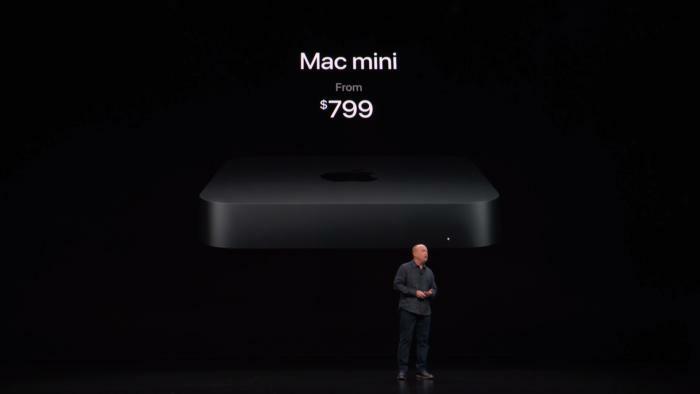 The new Mac Mini features a decent number of ports, with four Thunderbolt 3, a single HDMI 2.0, two USB 3.0 Gen 1 (5Gbps) Type A, 3.5mm headset jack, and gigabit ethernet (upgradable to 10Gb ethernet). The four Thunderbolt 3 ports and the lone HDMI 2.0 port can support either a total of 2 displays at 4096x2304 at 60Hz plus one display at 4096x2160 at 60Hz, or one display at 5120x2880 at 60Hz and one display at 4096x2160 at 60Hz. 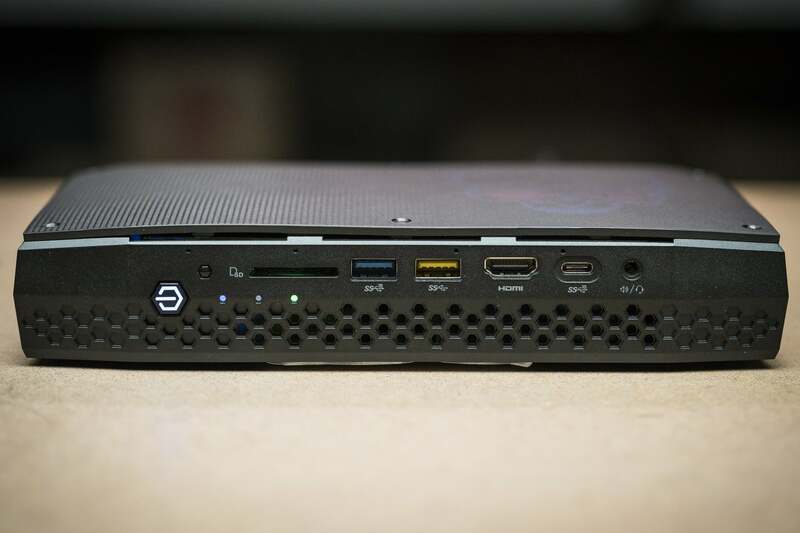 Impressively, Intel crams more ports into the Hades Canyon NUC’s smaller chassis. It sports two Thunderbolt 3, a USB 3.0 charging port, one USB 3.1 Gen 2 (10Gbps) Type A, one USB 3.1 Gen 2 (10Gbps) Type C, four USB 3.0 Type A, two HDMI 2.0a, two Mini DisplayPort 1.2, two gigabit ethernet, and a 3.5mm stereo headset jack. The rest of the Hades Canyon NUC's ports can be found on the opposite side of this VHS-tape-sized PC. Between the two Thunderbolt 3, two Mini DisplayPort, and two HDMI 2.0a ports, you can output to as many as six 4K displays simultaneously, with five at 60Hz and one at 30Hz. The Hades Canyon NUC also comes with an I/O header that carries signals for two USB 3.0, two USB 2.0, CEC, and the front panel. In other words, if for some reason there’s not already enough ports, you can expand their number. One of the big features that Apple is promoting for the refreshed Mac Mini is its T2 security chip, a module that provides storage drive encryption and protects the boot sequence from tampering. Windows-based PCs can offer similar features, but on the Hades Canyon NUC, it’s not a straightforward solution. Since you have to install Windows yourself, you’ll have to confirm that the Secure Boot option in the UEFI menu is switched on. You’ll also need to install an SSD that supports hardware encryption, as well as install management software for it. The Mac Mini comes in two standard configurations, with the Core i3 version starting at $799 and the Core i5 version starting at $1099. The former offers 8GB of DDR4/2666MHz RAM and a 128GB SSD, while the latter comes with 8GB of DDR/2666MHz RAM and a 256GB SSD. These prices include a full operating system (MacOS). Apple allows you to customize either of these systems with more RAM (16GB, 32GB, or 64GB) or a larger PCIe SSD (256GB, 512GB, 1TB, or 2TB). On its website, Apple does not state whether its drives are AHCI or NVME. Unlike the Mac Mini, which comes ready to use out of the box, the Hades Canyon NUC is most typically sold as a bare-bones kit that you have to equip with RAM and storage yourself. 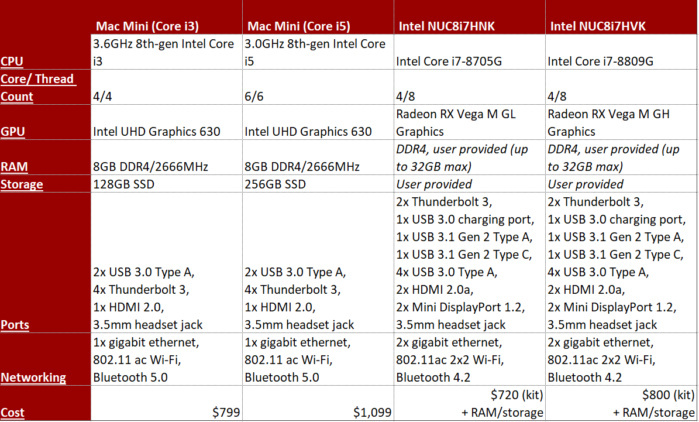 Currently, the Core i7-8705G model goes for $720, while the Core i7-8809G model can be found for as low as $800. However, you’ll still have to add another $70 for 8GB of DDR/2666MHz RAM; about $50 for a 128GB M.2 PCIe-NVMe drive or about $90 for an M.2 256GB PCI-NVMe drive; and $140 for a Windows 10 Home retail license. Rough total: $980 for the Core i7-8705G version with comparable specs to the Core i3 Mac Mini, and $1100 for the Core i7-8809G version with comparable specs to the Core i5 Mac Mini. Apple Mac Mini vs Intel NUC: Which one’s better? Comparing it with Intel’s Hades Canyon NUC is somewhat of an apples-to-oranges pairing, because the two systems have such different focuses. Apple is chasing professionals who do transcoding and other heavier workloads, while Intel had a laser focus on portable gaming. Which is better for you will obviously depend on what your needs are, and how much you’re willing to spend on them. However, putting them head-to-head does make one thing very clear: How slowly products get updated in the mini-PC space. For example, Zotac’s Magnus line could be a much closer natural rival for the Mac Mini, but it still sports a 7th-gen Intel processor. 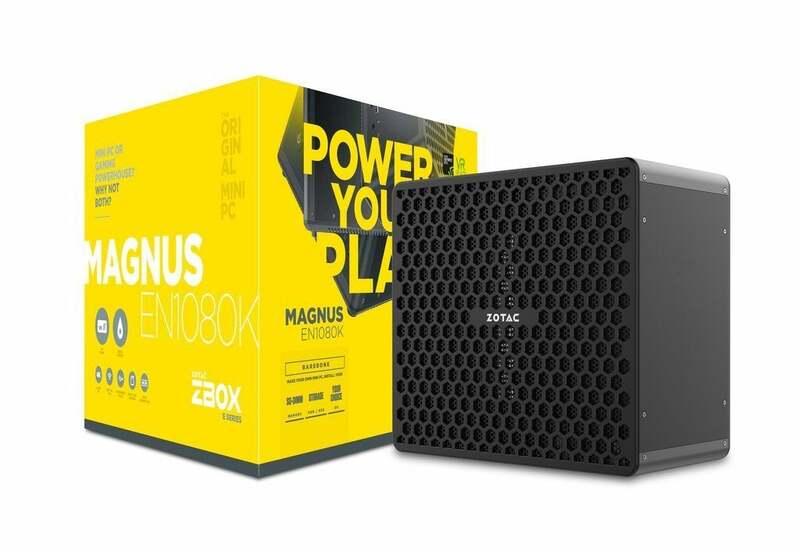 Zotac top-end Magnus mini-PC currently comes equipped with a Core i7-7700 and a GTX 1080. That said, Windows-based PCs always get updated more frequently than Apple’s Macs. It won’t take four years to see fresh hardware.